I know you’re itching to start early spring garden planting! 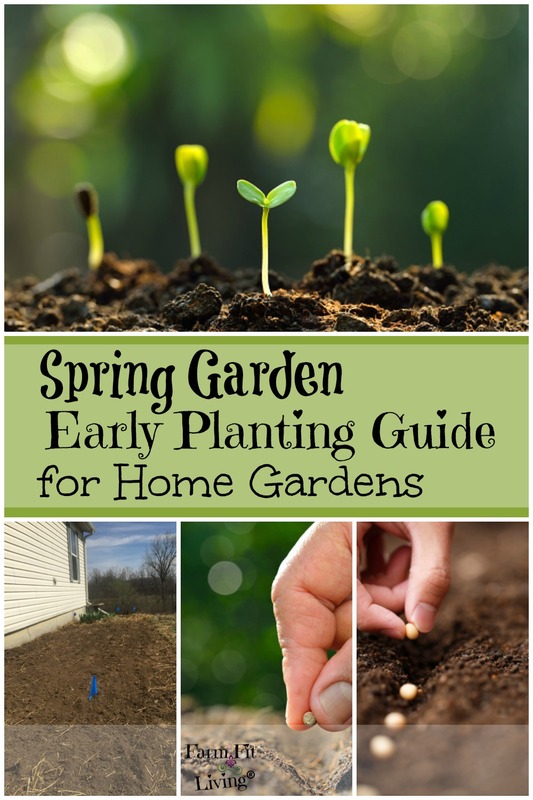 Here’s my early spring garden planting guide to help you start planning for your home garden. But prior to putting seeds and transplants into the ground, your soil must be in check. You must have the proper nutrients and pH level installed in your soil for what you are planting. The soil temperature should also be up to par. Use a soil thermometer like this one to check your soil temperature. You may not be in the same climate zone as I am. If you’re reading this from the north, your soil may not be as warm as mine yet. For this reason, as you are looking for information on spring garden planting, it’s important to test your soil temperature before you begin planting. While the health of the soil is important for proper plant nutrition, knowing soil temperature is an ideal tool for proper germination. If the soil is too cool when planting, your precious seeds can rot. Transplants can be stunted. The same can be said for soils that are too warm. Taking a soil temperature four to five days prior to planting can ensure a healthy temperate environment for new seeds and transplants. You can access my handy dandy Soil Temperature Data Printable. This printable is an easy way for you to have access to soil temperature recommendations for various vegetable seeds to germinate properly. How do you test your soil temperature? You’ll need to invest in a metal soil thermometer. Simply insert the soil thermometer into the soil 3.5 inches deep and wait for the reading. Easy Peasy! You will also need to be strategic about obtaining the proper soil temperature. The best time to get a good reading of the proper soil temperature is late morning around 10-11 a.m. This is because the temperature variation changes too much throughout the day and night. The lowest, most inaccurate readings you can get are right after dawn. The warmest readings occur around mid-afternoon. If you simply cannot take a reading at that mid-morning time for several days in a row, take a reading twice. The first should be before you leave for work in the mornings. The second reading is read when you return home. Then, average the two readings. Repeat this procedure for five days in a row prior to when you want to plant your first seeds. Now that you have your soil temperature in check, you’re ready to start early spring garden planting. I love early spring garden planting. It’s just something about getting into the garden that is so therapeutic and uplifting. 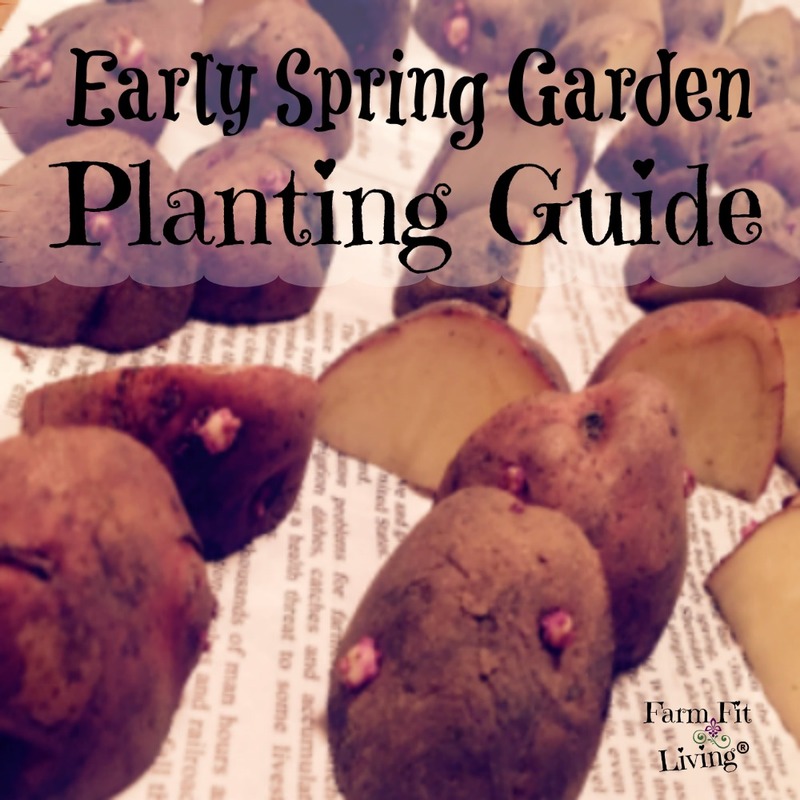 Early spring garden planting will consist of red potatoes, white baking potatoes, peas, onions, lettuce, spinach, carrots, and beets. There are other veggies you can plant in a spring garden, such as radishes, cauliflower, broccoli and cabbage. I plan to plant these items later into the summer for a fall garden. Right now, I’m focused on early spring garden planting. It all begins with the potatoes. The Irish potato is so versatile and easy to grow. It’s difficult to mess up growing a good crop of potatoes. In my climate zone, St. Patrick’s Day is a great day to plant seed potatoes. However, I watch the weather closely and monitor my soil temperature before I follow a calendar to start planting. I ordered my seed potatoes from Gurney’s that are great for my area as well as resistant to certain diseases. Preparation is key to a good potato crop. Here’s how I prepare my potatoes for planting. I quartered my potatoes a couple of days before planting and stored them in a warm, dark place. This allowed the seeds to dry out, toughen up and form a protective coating. Finally, the seed pieces were ready to plant. I planted each seed 8 inches apart and about 2 inches deep and covered the seeds completely with the soil. Use a tape measure to properly measure the seed distance. As the plants grow over the next few weeks, I plan to mulch with straw. This will help with weed control as well as keep the sun off new potatoes peeking up through the soil. Next to the potatoes, I plant the peas. Fresh garden peas are my FAVORITE veggie. I love picking them as they ripen, opening them up and eating them right out of the pod. To me, potatoes and peas go together. Maybe because my mom always used to make creamed new potatoes and peas after the first harvest. Yum. But before we can have fresh peas, we have to plant them. And it’s really super easy! Pea seeds are small and planted shallow at one-half inch deep. This is important to promote rapid germination and emergence, which happens in about one week. I spaced my seeds about 2.5 inches apart and cover completely with fresh soil. Again, you can use a tape measure for the spacing. As the plants grow, I will install a trellis for them to climb. Rabbits in my peas have been a problem for me in the past. I have tried almost everything to keep rabbits away, including a fence and barriers underneath. I plan to plant marigold seeds this year as I have heard they help detain rabbits. You would think two dogs would be the key to keeping rabbits away. Keeping rabbits under control and out of my peas is my number one concern this season. I’m planting yellow onions this year, in hopes of having a bountiful crop for blooming onions, onion rings and also seasoning sauces and recipes. Planting onions is an easy process. The bulbs are simply pushed into the ground one inch deep and three inches apart. It’s important to be sure onions have plenty of water. Also, onion bulbs love well drained soil. Given the right environment and soil, onions are easy to grow. You can mulch them, too, just like the potatoes for weed control. While lettuce can be transplanted, I prefer to plant seeds in my early spring garden. I invest in the seed tape for easier planting because those seeds are so tiny. Buttercrunch lettuce is the only variety of lettuce I choose to plant. I have tried other varieties in the past and none of them uphold the taste of buttercrunch. These tiny seeds also need to be planted very shallow at less than one-half inch. Within the seed tape, the seeds are already spaced about 6-8 inches apart, which is the correct spacing for the variety of lettuce I plant. I also purchase the spinach seeds in a seed tape. I prefer to use the seed tapes because the tiny seeds are already evenly spaced, making planting an easy process. Spinach also needs to be planted into very shallow and well-drained soil. As soon as baby leaves come on, the spinach is yours for the taking. Ohh, carrots. I’ve never been able to grow quality carrots in the soils of Northeast Kansas. But, I will not stop trying. The variety of carrots I’m planting this year are planted into an early spring garden. It’s very important to make sure soil is dry and loose to prevent compaction later on. Carrots also do well into a fall garden. For fall garden planting, the seeds are sown in late July to early August. Again, I’m using the seed tape for the carrots. I’ve always struggled with weeds competing with my carrots as they are coming up. I usually carefully pull the weeds myself as they are coming up. As the carrots grow bigger, I will mulch with straw to control the weeds. If I can get them to that point. I find beets to be much easier to grow. Finally, I enjoy growing (and eating) beets. Again, I have purchased the seed tape for beets. Beets and carrot tops are about the same when it comes to weeds. It’s important to control the weeds as the delicate tops are emerging to prevent competition. Not only are beets fun to grow, but gardening is great for physical activity. Plus, fresh veggies are an excellent source of fresh nutrition, as we all know. There are many other spring garden veggies you can plant that we choose not to. I’m not a huge fan of radishes, but they are planted in an early spring garden. Cole crops are also transplanted into an early spring garden. They are from seed a couple of months before transplanting day. Cauliflower, broccoli, and cabbage can be seeded in a late summer garden for a fall garden, which is how I choose to plant them. Also note that if you do not have space for a full garden outside, you can plant all of these crops into containers. As the weather becomes warmer, it feels great to be out in the spring garden. Early spring garden planting is so therapeutic. There’s something about playing in the cool, fluffy soil that is so soothing. 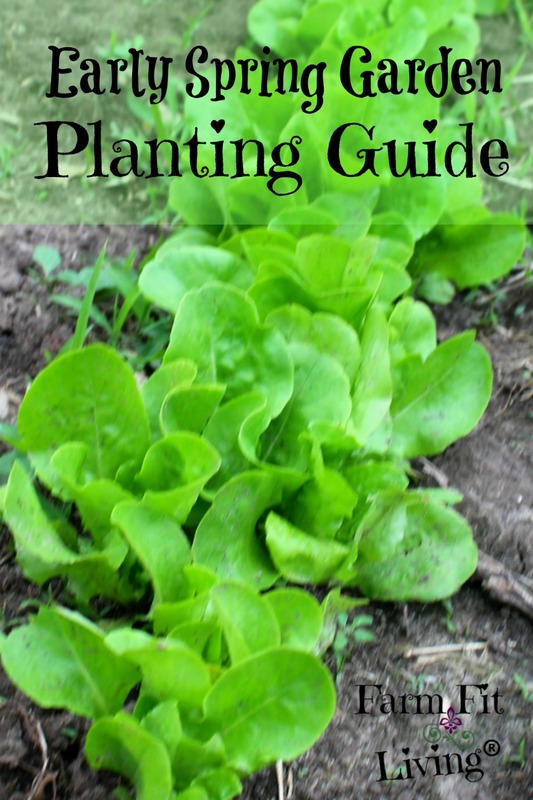 Use this early spring garden planting guide to plant your early spring garden. The printable for soil temperature will help you to verify what temperature the soil needs to be for whatever crop you choose to plant. 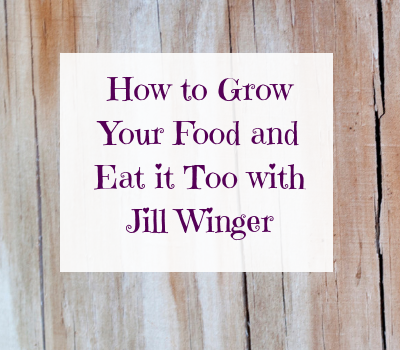 Growing fresh veggies for your family has never been easier! I hope this early spring garden planting guide gives you the resources you need for a bountiful harvest. Good luck to you, Liz! I think many gardeners underestimate the early warm weather and try to plant their garden early. The spring bug can definitely bite pretty hard! So, enjoy my soil temperature printable! 🙂 The best indicator that it is really time to plant those early spring veggies.